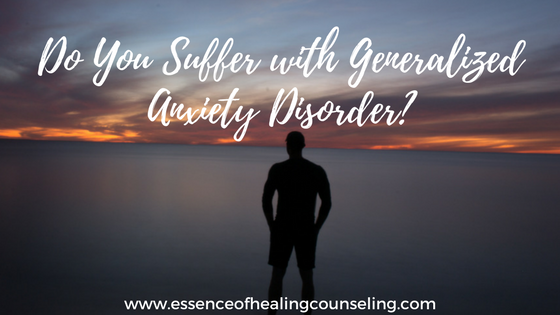 Do you suffer with Generalized Anxiety Disorder? Generalized Anxiety disorder (also known as GAD) is described as constant and excessive worry about multiple things. Excessive worry is defined as worrying without even having something wrong or worrying in an amount that is disparate to the actual risk. People who suffer from GAD do not worry about just one thing they worry about multiple things. They have a hard time controlling how much they worry. Often times they worry about things other people would not normally worry about. They have anxiety and fear that the worst possible outcome will happen. People with GAD spend a lot of time thinking about the future and predicting the worst case scenario. People who have GAD also complain about experiencing stomach issues such as nausea or diarrhea. They may also complain about getting frequent headaches and having back or neck pain. People who have GAD have anxiety and worry that gets in the way of their daily living. Their anxiety and worry can get in the way of their performing at work or in school. It can also have a negative impact on their relationships. GAD is a difficult thing to deal with. The good news is that it is completely treatable. Scientific evidence and research has shown that Cognitive Behavioral Therapy is highly effective in treating people who suffer with GAD. If you think that you might have GAD make an appointment with a local therapist in your area that specializes in Cognitive Behavioral therapy. Learn the tools you need to get rid of it so that you can live the life that you want. Roberta Alves is a therapist and counselor at the Essence of Healing Counseling with locations in Ft. Lauderdale and Coral Gables. She is a Certified Anxiety Specialist and has a high success rate with eliminating anxiety from her clients’ lives. She uses a scientific and evidence based type of therapy called Cognitive Behavioral Therapy. Research has shown that Cognitive Behavioral Therapy is proven to be extremely effective in treating anxiety. Roberta is truly passionate about the work she does and loves serving her clients in the Coral Gables and Ft. Lauderdale areas. If you want to learn the proven techniques to get rid of your anxiety call 954-393-2930 to schedule an appointment today.